High pressure liquid processes can now be monitored effectively with very little intrusion into tanks or piping. 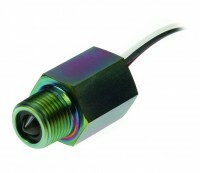 The ELS-1200 optical level switch features fused glass prisms fused to zinc/nickel plated, carbon steel housings. You will find them to be a compact, reliable and durable solution to liquid level monitoring of refrigerant, compressor oil, hydraulic system reservoirs and machine tools. These electro-optic switches feature a one piece removable electronics module with 1/2 NPT conduit connection with an O-ring seal to protect against moisture intrusion. Simply unthread the 1/2″NPT conduit connection for easy replacement of the electronics module without the inconvenience of emptying or depressurising tanks. ELS-1200 switches feature glass prisms fused to zinc/nickel plated, carbon steel housings. Select from either 1/2″ NPT mounting connections or 3/4″-16 UNJF-3A straight thread connections with an external O-ring seal. They monitor high pressure liquid processes with very little intrusion into tanks or piping.